Do You Know What a Wall Hugger Futon Frame is? A Wall Hugger™ is a type of futon frame that does not require the frame to be moved away from the wall when converting the frame to the bed position. Another name is zero tolerance futon. Standard Bi-Fold Futon frames must be pulled away from the wall before you convert them to a bed! If you do not use your futon frequently, this may not seem like a big deal…..But if you use your futon on a regular basis, moving it away from the wall can sometimes become a pain. It is also frustrating if you don’t pull the frame far enough away from the wall and the back deck scratches your walls! Over the years futon mattresses have evolved and now come with latex, wool, and memory foam. Although this adds comfort to your futon mattress, IT ALSO ADDS WEIGHT! Why is this a big deal? Well for one, the frame and the mattress may weigh over 300 pounds. Who wants to move something this heavy just to go to bed or worse yet, have to call your neighbor to come over and help you move it? When purchasing your futon frame it is important to think about how often you will be using it! If you are putting it in a spare room that will NEVER be used, then you can get away with a standard Bi-Fold futon frame. But if you want the ease of having the frame do all the work, then we definitely recommend a TRUE Wall Hugger™ by Strata Furniture. 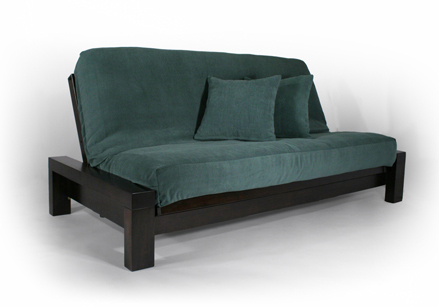 Strata Furniture is the ONLY futon frame company that makes a true Wall Hugger™ futon. Place the frame next to the wall and the front loading mechanism allows you to convert the frame from sofa to bed quickly and easily. Unlike typical futons, having a Wall Hugger™ ensures you will not scratch or dent your walls. Click here to view all of our Wall Hugger™ futon frames by Strata!